St Paul was an influential figure in the early development of Christianity. 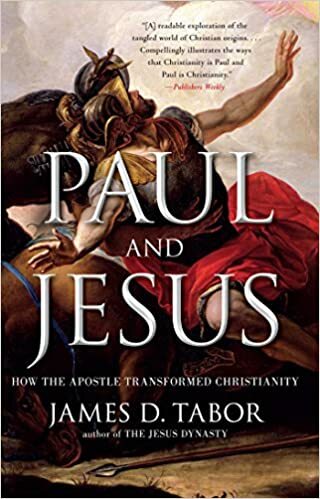 His writings and epistles form a key section of the New Testament; St Paul helped to codify and unify the direction of the emerging religion of Christianity. 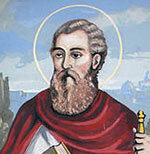 In particular, St Paul emphasised the role that salvation is based on faith and not religious customs. 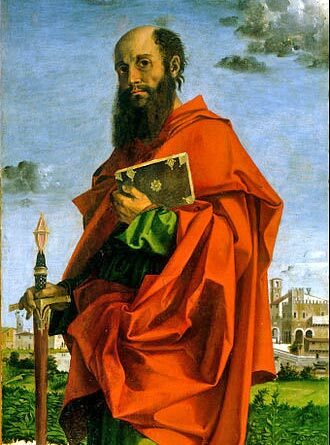 St Paul was both Jewish and a Roman citizen; in his early life, he took part in the persecution of Christians. However, on the road to Damascus, he underwent a conversion and became a committed Christian himself. St Paul, also known as Saul, ethnically was Jewish, coming from a devout Jewish family. He was also born a Roman Citizen in Tarsus, Cilicia, South Turkey. He grew up in Jerusalem and was brought up by Gamaliel, a leading authority in the Jewish religious establishment (Sanhedrin). In addition to learning religious scriptures, he also studied Greek philosophers and was well acquainted with the Stoic philosophers, who advocated a virtuous acceptance of life as a path to happiness. In his daily life, he was a tent maker. During his early life, St Paul was a Pharisee – a group of Jewish people who administered the law. He admitted to participating “beyond measure” in the persecution of Christians. This included taking part in the stoning of Stephen, a Christian. Acts 7:58-60;22:20. One reason St Paul was so critical of the new sect which followed Jesus Christ was the fact he was appalled that Jesus died a ‘criminal’s death’ on the cross. He couldn’t assimilate that with how a Messiah would be treated. Around 31-36 AD, St Paul relates how he became converted from a persecutor of Christians to a devout follower. However, on the road to Damascus, he reported to being blinded by a vision of Jesus Christ. For three days after the vision, he remained blind and undertook a fast He later healed of his blindness by a Christian – Ananias of Damascus. After his vision and healing, he proclaimed the divinity of Jesus Christ and dedicated his life to spreading the Christian message. St Paul explained that he was a servant of Jesus Christ and his unexpected conversion to ardent Christian was due to the Grace of God and not reason or intellect. St Paul became involved in doctrinal disputes amongst the early followers of Christ. St Paul taught that old religious rites, such as circumcision were no longer necessary. St Paul taught that faith in the redemptive power of Jesus Christ, who died on the cross to save sinners was the essence of Christianity. St Paul also negated the idea that Jews were a special people, due to their lineage from Abraham. St Paul’s teachings helped move the early sect of Judaism into the separate religion of Christianity. Before St Paul, followers of Jesus Christ were still associated with Judaism. St Paul successfully argued that Gentiles (non-Jews) could be converted directly to Christianity and didn’t need to become Jews first. St Paul threw himself into missionary work. Over the next few years, he travelled to Damascus and later Jerusalem. He made several missionary journeys around the Mediterranean basin where he sought to spread the teachings of Jesus and offer support to the fledgeling Christian community. St Paul visited many places such as the island of Cypress, Pamphylia, Pisidia, and Lycaonia, all in Asia Minor. Later, he travelled as far west as Spain. He established churches at Pisidian Antioch, Iconium, Lystra, and Derbe. He later made Ephesus the central place of his missionary activity. During a visit to Athens, he gave one of his most memorable and well-documented speeches; it became known as the Areopagus sermon Acts 17:16-34. St Paul was dismayed by the number of pagan gods on display. In speaking to the crowd he criticised their pagan worship. His missionary work was often difficult and dangerous, he often met an unwelcome response. He supported himself financially by continuing to work as a tent maker. St Paul was instrumental in deciding that former Jewish practises such as circumcision and dietary law were not required by Christians. St Paul taught that Jesus Christ was a divine being, and salvation could be achieved by faith alone. St Paul was a key theologian on the doctrine of atonement. Paul taught that Christians are freed from sin through Jesus’ death and resurrection. On arriving in Jerusalem in 57 AD, he became embroiled in controversy over his rejection of Jewish customs. He was arrested and held in a prison in Caesarea for two years. Since he could claim rights as a Roman citizen, he was eventually released. He spent his remaining years writing letters to the early church and acting as a missionary. Details about his death are uncertain. But, tradition suggests he was beheaded. Within the 27 books of the New Testament, seven books are signed by St Paul and are considered to be his writings – Romans, 1 Corinthians, 2 Corinthians, Galatians, Philippians, 1 Thessalonians and Philemon. Another seven book may have had input from St Paul, but the authorship is uncertain. However, it should be noted that the letter to the Romans was delivered by a woman – Phoebe, the first known deacon of the Christian church. A more inclusive view of women by St Paul is found in Galatians 3:28. Although St Paul played a major role in influencing the early Christianity, he has been criticised for distorting the original message of Jesus Christ. 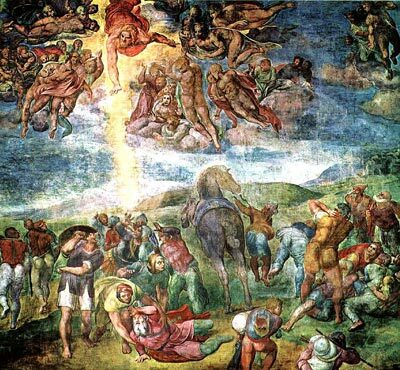 At the time of St Paul, there were differing interpretations and no consensus on aspects of the new religion. St Paul placed greater emphasis on the ideas of original sin, atonement, and the role of Jesus Christ’s crucifixion in offering redemptive power. St. Paul is the patron saint of missionaries, evangelists, writers and public workers. His feast day is on June 29 when he is honoured with Saint Peter. Citation: Pettinger, Tejvan. “Biography of St Paul”, Oxford, UK – www.biographyonline.net. Published: 3rd August. 2014. Last updated 13th March 2018. 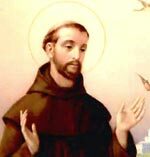 Famous saints – Famous saints from the main religious traditions of Christianity, Hinduism, Islam, Judaism and Buddhism. Includes St Francis of Assisi, Mirabai and Guru Nanak.